The Mexican peso ends 2018 with a slight decline against the US dollar, however, is among the top performers across emerging market currencies, after having remained relatively stable while emerging assets registered significant losses. The year 2019 presents major challenges, with a new political scenario in Mexico, an economy growing slowly, and a global context with increasing fears. Volatility has almost everything in favor to remain elevated. The dollar rose against most of the emerging currencies throughout 2018, including among these the Mexican peso. The rise against this currency was less than 2%, which placed the MXN as one of the strongest. The USD/MXN throughout 2018 can be divided into two parts. During the first half of the year rose in the run-up to the presidential elections in Mexico, in a context of markets' concern about the expected victory of Andrés Manuel López Obrador and the dollar's strong rise against emerging currencies. In the second half of the year, the best moment of the Mexican peso took place, after moderation in AMLO’s tone, which led the USD/MXN to 18.40. The emerging currencies did not stop being under pressure, and with the end of the honeymoon between AMLO and the markets, after the citizen consultation for the new airport, the dollar flew up to 20.60. During the year, traded above 18.00 and below 21.00. The price range (the distance between the maximum and the minimum) was the lowest since 2014. Even in spite of the lower volatility, it continued to offer interesting trading opportunities. The long-term trend in continues to point higher, but in 2018 the USD/MXN failed to surpass 21.00. Prices near that level, represent a concern to officials of the central bank and also of the executive power. The Mexican economy is expected to grow between 1.5% and 2.5% in 2019 and inflation to slow down, according to projections released by the central bank, averaging 3.85% at the end of the year, a level still above the target of Banxico. The government plans to obtain a primary fiscal surplus despite the increase in spending in 2019, through better collection and cutting certain expenses. A recovery in the price of oil would provide more funds to the government. The market received the “economic package” (budget and other economic initiatives) relatively well. The main domestic risk to growth is the lack of confidence of businesspeople towards the administration of Andrés Manuel López Obrador. Each day will be an opportunity to improve relationships, but at the same time, with risks of worsening. The cancellation of the new Texcoco airport under construction left a precedent that might weigh on the level of investment in 2019. On the inflation side, the deceleration is expected to continue at a gradual pace, and no greater domestic risks are now glimpsed. As indicated by the central bank, the main threat is the exchange rate. A rise in the dollar would be the factor that triggers an increase in inflation. For this reason, monetary policy could continue with high rates if the US dollar appreciates or if inflation remains at high levels. An external crisis is expected to have an impact in Mexico, both on the activity and the exchange rate, leading to the possibility of further adjustments in monetary policy. If under such scenario, the exchange rate remains steady (or appreciates), Banxico could look for ways to reduce the rate, to boost activity. The T-MEC trade agreement, which replaces NAFTA, is another risk. If the project fails to pass any Parliament, the current agreement will come into risk, generating great uncertainty and could strongly impact foreign trade and drag the rest of the sectors. Another source of the external risks comes from Latin America, with an a priori focus on Argentina, Brazil, and Venezuela. In 2018 there was a currency crisis in Argentina. Although there has been some calm during the last two months, 2019 can be another difficult year, considering that external vulnerabilities have not yet been overcome and, above all, there will be presidential elections. In Brazil, at the beginning of 2019, Jair Bolsonaro will assume the presidency, a great unknown. While in Venezuela the severe economic crisis continues, with ongoing hyperinflation. Argentina and Venezuela contagion risk is limited, but they are part of the global context. The central bank of Mexico ends 2018 with the highest interest rate in years. Months ago the speculation was about the possibility of a rate cut at the end of the year. What changed? The Mexican peso lost ground, inflation slowed at a slower pace than expected, the investment outlook clouded, and to complete the picture, the external context changed for the worst. In 2019, we do not rule out further increases in the key rate if the dollar rises significantly. The exchange rate has become the critical variable. A drop in the interest rate should not occur until at least the second quarter. For it to happen, the exchange rate should look stable, and inflation should be at the central bank’s target or very close. In addition, there should not be critical external risks. The Governing Board of Banxico will have several new members in 2019. Its independence from the executive power will be tested. If there are signs that they are influenced in their decisions by the López Obrador team, it would be a clear negative signal, not only for the peso but for Mexican assets in general. The Mexican peso is on track to close the year with a minor loss against the dollar. The chart shows that it could rise (USD/MXN decline), particularly early in 2019, as long as a weekly close does not occur well above 20.60. A good global climate, an improvement in the confidence of investors towards the new administration, a favorable arrangement with the bondholders of the international airport under construction (to be canceled soon), a good relationship between AMLO and Trump, are all factors that can be positive for the Mexican peso. The 19.40 zone can be reached easily in a positive context. Below, the area between 18.40 and 18.60, should offer support during the first half of the year and mark a limit to the appreciation of the MXN. Although if it breaks lower, it could signal more losses ahead over the medium term. The chart shows increasing odds of breaking during 2019, the limits of 2018. Such a scenario would favor volatility. During the last quarter of 2018, the dollar failed to hold above 20.50/60. To resume the bullish path, it needs to consolidate on top, and then, a test of 21.00 would be expected. If it keeps rising above, approaching 22.00, the word "intervention" or talks about more rate hikes would hit the wires. There are details, both from the fundamental and technical point of view, which can lead to 2019 being a year of high volatility in USD/MXN, in several directions. 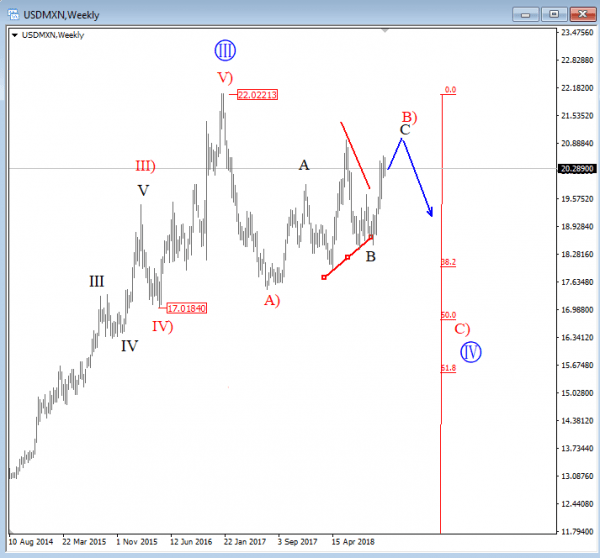 USDMXN turned sharply down from 22.00 in 2017 and then moved into a recovery mode in 2018 which is seen as a corrective rise. We labeled this as wave B) that belongs to deeper ongoing retracement with wave C) still in view. As such, price may be lower in 2019, with a drop to 17-18 area to complete big wave IV pullback.